Today marks the Feast of Saint Elizabeth, mother of John the Baptist and relative of Mary of Nazareth. It is the feast of a familiar figure in the tradition. Yet, since she is almost always remembered in relation to John or Mary, she is easily overlooked. It might seem, then, that we ought to find a way to remember Elizabeth in her own right, apart from her more often remembered son and cousin. But, it seems to me, remembering Elizabeth primarily as a woman in relationship with others is the best way to remember her. It is to remember her as a particular embodiment of the symbol of the communion of saints. By calling Elizabeth an embodiment of the symbol of the communion of saints, I am not simply saying that she is one of many canonized saints recognized by the church. Instead, I am recalling the particular way she is portrayed as living in the world. Theologian Elizabeth Johnson reminds us that the symbol of the communion of saints speaks to the concrete struggle of all of God’s people to live in communion with one another and all of creation in creative fidelity to the vision of life revealed in the person of Jesus (1). This struggle is shared by many who have gone before us and many who will come after us. Johnson invites us to see those persons we identify as saints not as larger than life figures but as our sisters and brothers, who knew the same struggles we know and whose example of love encourages us to similarly be in right relationship with all of creation (2). The invitation to see Elizabeth as such a sister is both illuminated and obscured by her presentation in the tradition. In Luke’s gospel she is always presented in scenes of profound relationality. But, each time we see her, it is easy to view her as a minor character. Both at the announcement of her pregnancy and in days after she gives birth, her husband Zechariah appears to be the central figure. In the story of the Visitation, it is Mary who sings the great song of praise to the God of the poor. However, Elizabeth is not a silent or passive presence in any of these scenes. She is a woman who responds to God’s word spoken within her heart and lives in a way that invites others to hear the word of God spoken within their own hearts. The story of the Visitation is a telling example of how Elizabeth’s way of living enables those she encounters to live in right relationship with others and God. In this scene, Luke does what he does so well throughout his gospel. He turns the expectation of the reader on its head. For it is not Zechariah the temple priest but Elizabeth the woman ignored by her own community (Lk 1:60-62) who embraces and encourages Mary. As Johnson notes, in the encounter of Mary and Elizabeth, we find a profound example of “mutual female empowerment” (3). With these words, Elizabeth affirms Mary as a woman who has heard God and responded. Johnson writes, “The figure of Elizabeth stands as a moving embodiment of the wisdom and care that older women can offer younger ones, who, brave as they are, are just starting out on their journey through life. A Spirit-filled woman, she exudes blessing on others” (4). Elizabeth, in other words, is a woman who lives her own Yes to God in a way that empowers others to live their own Yes to God. 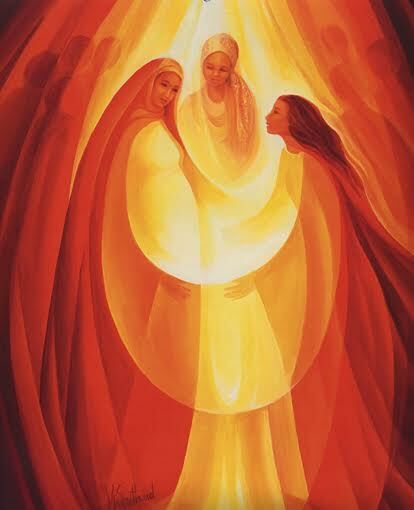 She invites Mary to share in the joy of liberation that she has found in the gift of her own child (Lk 1:25). Often Mary’s Canticle can dominate our reading of the Visitation. However, to look past Elizabeth’s affirmation of Mary is to miss an important part of the story. Johnson argues that, by responding in faith to God’s initiative within her, Elizabeth was able to help Mary hear and interpret that word of God spoken so uniquely in her own heart (5). Elizabeth’s affirmation of Mary, in many ways, empowers Mary to sing the song that praises God for the great No that is included in Mary’s Yes. Elizabeth, whose affirmation of Mary was a way to reject her own community’s dismissal of her as a woman, empowers Mary to recognize that her Yes to God was a No to the powers of death that stifle the ability of all of creation to live a life of love. The symbol of the communion of saints recalls our communal struggle with those who have gone before us, those who walk with us today, and those who will come after us to live according to the reign of God. When we remember Elizabeth as a particular embodiment of this communal struggle to live in a way that embraces God’s vision for creation, we are called to recognize the Elizabeths in our lives. We are called to recognize those persons in our time who invite us to live according to God’s reign through their wisdom and example—despite attempts to silence them—and to join them in their work. When I reflect on Elizabeth today, I cannot help but think of many of the women religious whom I have been blessed to know. So many of these Spirit-filled women have revealed to me what it means to live according to God’s vision for creation. And, like Elizabeth, these women speak from a place of marginalization. Elizabeth was unjustly marginalized, first, as a woman, and, second, as a barren woman. American women religious are unjustly marginalized in the church today, first, as women, and, second, as women who have been ostracized by some members of the church’s leadership for the manner in which they have lived according to the vision of God’s reign. I once heard Peg preach on the story of the Visitation at the closing liturgy of a silent retreat. She reminded us that Mary and Elizabeth are not two unattainable, abstract ideals of discipleship. They are our two elder sisters in faith. They played their part in God’s saving work by cooperating with God’s grace in the same manner to which we are all called. None of us—not even Mary and Elizabeth, who embraced one another in mutual empowerment—can respond to God’s invitation alone. We all need to be of service to one another as we embrace the gifts that allow us to make God known and loved in the world. Elizabeth responded to God’s call and empowered Mary to give voice to the great No of her Yes. Mary responded to God’s initiative and brought God into the world in radically new way. Peg asked how we are called to affirm one another and to bring God into the world: how we are called to live a life of collaborative discipleship. When Jesus tells his disciples in the Fourth Gospel that he has come so that all creation may have life and have it to full, he is not speaking of life in an otherworldly manner. He is inviting his disciples to live this life, here and now, in a new way—in a fuller, more abundant way. He is inviting them to live according to God’s vision for all of creation. He is inviting his disciples to live a life modeled on his own ministry: one guided entirely by the love of God each person finds in her own heart, one modeled after Jesus’ example of stooping and washing one another’s feet, one in which we act as good shepherds by seeking out those abandoned by the world and inviting them to share in the fullness of life revealed in God’s love. This is the life of the communion of saints. This is the way of Elizabeth, who in her vulnerability ministered to and affirmed her young relative. Peg often said, “We are each a word of God spoken only once.” Elizabeth embraced this truth and, speaking that word to the world, ministered to Mary so that Mary might understand what this truth meant in her own life. When we remember Elizabeth as an embodiment of the communion of saints, we are invited to ponder our own embrace of discipleship: How am I called to embody the symbol of the communion of saints in my own life? How am I called to be God’s spoken word for the life of the world? B. Kevin Brown is doctoral student in systematic theology at Boston College. (1) Elizabeth A. Johnson, Friends of God and Prophets: A Feminist Theological Reading of the Communion of Saints (New York: Continuum, 1998), 229-232. (2) Johnson, Friends of God and Prophets, 233-239. (3) Elizabeth A. Johnson, Truly our Sister: A Theology of Mary in the Communion of Saints (New York: Continuum, 2003), 261. (4) Johnson, Truly our Sister, 262. (5) Johnson, Truly our Sister, 263.